Bikes: Many. Ralieigh sports`s, Raleigh Superbe, sears Spaceliner, Firestone supercruisers, many vintage mountain bikes, random cruisers, and other unique bikes. 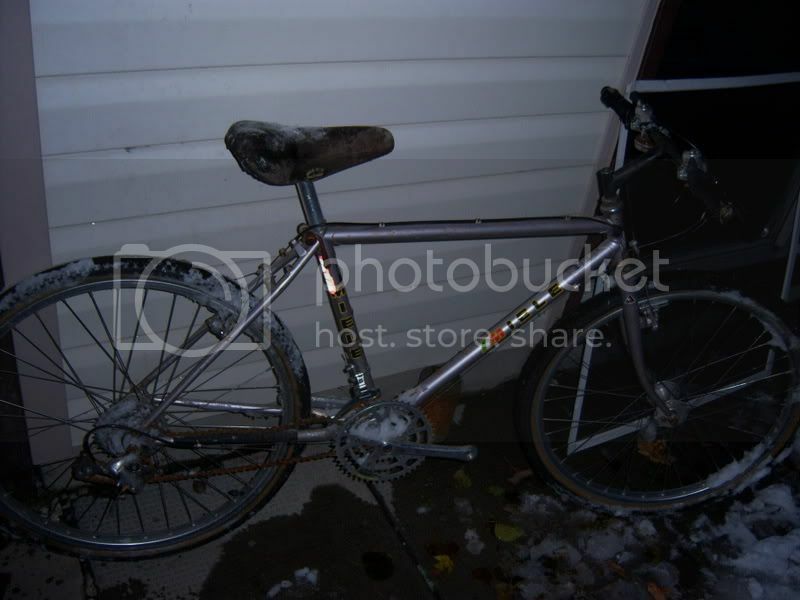 I picked up this Miele wich was thrown out in the garbage, most of it works but theres no pedals and chains abit rusted I don't know how old it is but it looks fairly old and intrestion, anyone know anything about this neat mountain bike. 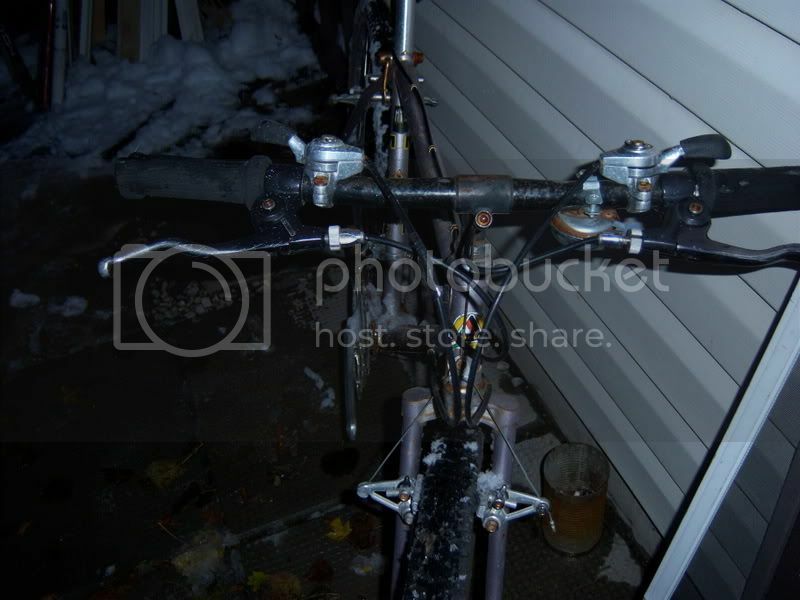 That's a nice lugged steel mountain bike you got there! If it's your size and you hope to use it I suggest you strip the frame of all parts (hopefully nothing is siezed up) and replace what's needed as it looks to have been neglected for a while. I suspect it's a mid level model from the mid 1980's, based on it being lugged and using 6 speed thumb shifters. I didn't realize Miele ever made MTB's. Hmm... Learn something new every day. I don't understand how anyone can treat a bike like that though. Ah well. Hopefully it's in good hands now. Yeah we got fresh snow to, because i'm also from ottawa. lol, this is the oldest mountain bike i've had I think, I might keep it, big tires and fat alloy rims to lol It looks like a road bike frame but it's a mountain bike. Top of the line Miele Aries ATB, circa 1984-1986, but most likely a 1986, with a replacement rear derailleur. We got 20cm of snow, two nights ago. So, What should I do with this? I have a really high end bike but it breaks to much and it's anoyying, these older bikes will proberly do better, should I just clean it up and replace wheels, or do some break replacing, rims, and bars, those bars and neck need replacing or atleast paint. also if you happen to know what the rear shifter looked like, that would rock, I got a nice collection of parts, proberly have one. Take evreything off the frame. Clean and polish the frame. repack the bearings. Clean the parts that work . Replace the parts that dont with the parts you have, assuming you like them. Then buy what you need to complete it. Try to find the reason it was thrown out. Sometimes its simple. I got a free raleigh and the only thing that needed to be done was adjusting the stops on the replacement derailer. Great find. This one was left to rot, I've cleaned the parts abit and got the bike moving, the frame is a turn off though, needs paint, everything els other then tires is great. 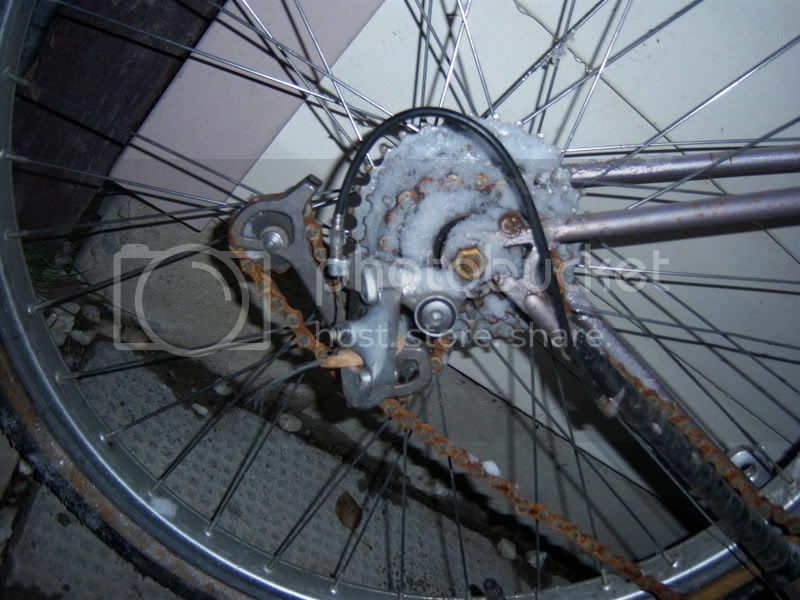 Original rear derailleur would have been the Deore XT or Deore XT Superplate. The ones with the stag's head emblem. Frame looks good to me, from the pics at least. New chain, cables, tires and tubes and you're probably good to go (about $50 to $80 for all that and you do the work). I hope the seat tube and stem aren't stuck!